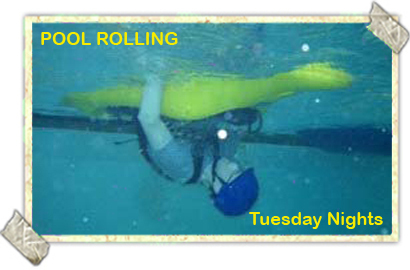 Pool rolling sessions are held every Tuesday night, January through March, from 7:00 pm to 9:00 pm. These pool sessions are for practice only. Boats and gear must be clean! Detailed information and cost are below. Tuesday, January 8 through Tuesday April 9, (except March 19, pool closed) 7 - 9 PM at Piney Branch Elementary School, 7510 Maple Ave, Takoma Park, Maryland. $20 per night. Note the new time - 7:00 PM that should make for an earlier night for folks. Also, we have to do ACA waivers and insurance. The first night you come, you need to put your name and information on the event report sheet, sign a waiver, and either provide your ACA number or pay $5 additional for ACA insurance. You only need to do this once to cover the entire season. So please have your ACA number handy! If Montgomery County schools are closed or evening activities cancelled due to weather or other problems, the pool will be closed. Any updates will be posted on Paddle Prattle on Tuesday afternoon as information becomes available. This is an open pool session, not a class. CCA does not offer instruction or gear, and paddlers are responsible for their own gear and safety. However, if you want advice and help, you're likely to find it if you ask folks. If you have any questions, please text Ron Ray on 301 974 1004.